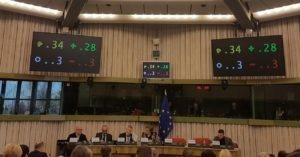 On 14 February the European Parliament Committee on Regional Development (REGI Committee) adopted its report on the European Regional Development Fund (ERDF) and Cohesion Fund (CF) 2021–2027. The Committee’s proposals clearly contribute to using the potential of these funds to promote equality, social inclusion and non-discrimination of disadvantaged groups and notably of the Roma population. EURoma very much welcomes the proposal to explicitly mention Roma in the text, which means a straightforward acknowledgement of the need for ERDF-CF to specifically address Roma population and reinforce the efforts to tackle the unequal situation that Roma face across the EU. The Committee recognises the increasingly impact that many of the greatest challenges in Europe have on ‘marginalised Roma communities’ and calls for the need for the ERDF-CF to contribute to improving the living conditions of Roma and fulfilling their true potential as EU citizens. It also proposes to explicitly mention Roma in Specific Objective (d) (a more social Europe implementing the European Pillar of Social Rights), investment priority iii (promoting the socioeconomic inclusion of marginalised communities and deprived communities such as Roma and disadvantage groups, through integrated actions including housing and social services) and in the indicator framework for monitoring progress, notably one of the common outputs and result indicators (members of marginalised communities and disadvantaged groups through integrated actions including housing and social services (Roma)). This recognition is crucial as there is historical evidence that when Roma are not explicitly named and are considered within overall conception of marginalised groups, they are very likely left aside and, in some possible cases, further investments on Roma inclusion may be reduced or even avoided. This explicit acknowledgment is in line with the introduction of the IP 9.2. on the ‘Socio-economic integration of marginalised communities such as the Roma’ in the 2014-2020 ESI Funds Regulations (ESF), and the proposal, backed by the European Parliament, to maintain this explicit acknowledgement in future ESF+ Regulation (Specific Objective (viii) ‘Promoting socio-economic integration of third country nationals and of marginalised communities such as the Roma’). Therefore it reflects the coherence between EU financial instruments and between EU financial tools and existing EU policy commitments (EU Framework for National Roma Integration Strategies). We are also glad to see throughout the Committee’s report other proposals to ensure that the text has a more inclusive and non-discriminatory approach and that better reflects the potential of the ERDF-CF to promote equality, social inclusion and non-discrimination of all European citizens, including those groups with a high level of people experiencing or at risk of poverty, discrimination or social exclusion, and to address the situation of poverty that still today affect many European citizens, among them many Roma. While the economic, environmental and climate dimensions are important, the potential of these funds to address the social challenges facing EU urban and rural areas should not be disregarded. The promotion of an increased coordination, complementarity and coherence between different funding instruments, particularly the ERDF, the CF, the ESF+, the European Maritime and Fisheries Fund (EMFF) and the European Fund for Agricultural Development (EAFRD), promoting a multifund and integrated approach. The extension of the actions eligible under ERDF-CF to include the ‘physical, economic and social regeneration in deprived communities’ and the ‘investments in housing, when owned by public authorities or non-profit operators for use as housing designated for low-income households or people with special needs’ (under Specific objective (d) ‘a more social Europe implementing the European Pillar of Social Rights’). Promoting ‘universal access to water’ is another important proposal as the lack of access to water and sewage is still a reality for many European citizens, and in particular for some disadvantaged groups, including Roma (according to a FRA survey addressing the housing situation of Roma and its evolution in the 2011-2016 period, 30% Roma live in housing without tap water inside).These investments could contribute to improving the housing conditions of the many European citizens that are still not adequately housed. Available data show that the housing conditions of Roma have not changed very much over the last years and that there is still a huge gap with the majority society (according to a FRA survey, 38% Roma live in housing without a toilet, shower or bathroom; and 10% in housing without electricity). The potential of ESI Funds, mainly ERDF and ESF, to address this situation by focusing investments around housing needs does not seem to be fully exploited and many opportunities remain untapped. The meaningful participation of regional and local authorities, civil society organisations including beneficiaries in all stages of the preparation, implementation, monitoring and evaluation of the Programmes under ERDF, in line with principles, set in the European Code of Conduct on Partnership.While some progress in the implementation of the partnership principle was achieved during the current programming period, future Regulation should emphasize the functioning of partnership structures throughout the programming period. The partnership principle should be considered as a continuous process (that adds value to the implementation of funds on the ground) and not only as an initial requisite for accessing the funds. The increased attention given to the capacity building of relevant public authorities. Indeed the improvement of the capacity of programme authorities and those bodies linked to the implementation of the Funds, together with the enhancement of cooperation with partners both within and outside a given Member States are essential to achieve impact. In particular transnational cooperation is a key tool for social innovation. Therefore further emphasis should be given to this component and its focus on the most disadvantaged groups such as Roma. Promotion of active transnational cooperation (both multilateral or bilateral) on Roma issues should be foreseen as an effective way to advance in social cohesion, both providing the adequate conditions to allow for active transfer of existing positive practices to other EU contexts and for establishing cooperation mechanisms between countries of origin and destination of EU Mobile Roma to jointly find solutions and improve their living conditions. The inclusion of a explicit reference to the inclusion of third-country nationals. In this sense, we recall the need to also pay particular attention to Roma from third countries as well as to those Roma from EU Member States exercising their right to freedom of movement (with particular attention to children), as they are a particularly disadvantaged social group in many Member States. Otherwise, there is a risk that national investments may disregard non-national Roma (EU citizens), reaching only national Roma. The reinforced link between all EU funding and fundamental rights, including the Charter of Fundamental Rights of the EU, and overall with international binding recommendations, as a well as for the UN 2030 Agenda for Sustainable Development is another key element. This essential approach should be further reinforced by linking rights with policies and overall EU funding. They should be considered as the baseline for all EU funds interventions. The report is expected to be discussed in plenary on 26/03/2019. We trust it will be backed and adopted by the plenary.